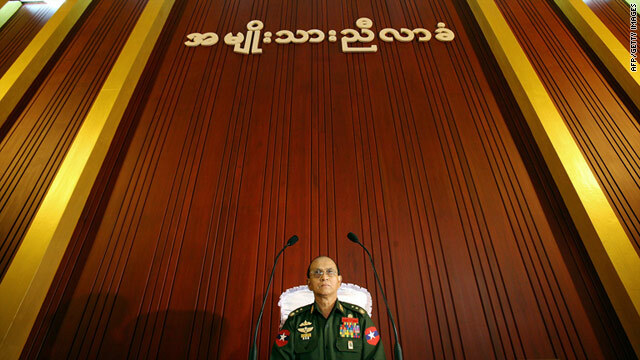 Lieutenant General Thein Sein, sworn in as the new president of Myanmar, shown in a file picture from 2006. (CNN) -- Myanmar's former Prime Minister Thein Sein has been sworn in as the country's new president, marking the end of the military body that has governed the Asian nation for decades, state-run Myanmar Radio reported Wednesday. Tin Myint Oo and Sai Muak Kham will serve as vice presidents. The president named 30 ministers and 39 deputy ministers to his government, according to state-run radio. In February, Myanmar convened its first parliament in more than two decades in the capital, Naypyidaw. The lawmakers came into office after elections were held in November for the first time in 20 years. The elections drew fire from critics who said the voting was aimed at creating a facade of democracy. The regime refused to allow international monitors to oversee the race and would not allow international journalists to cover the voting from inside the country. Journalists who reported from inside Myanmar had to do so surreptitiously. The military junta also overhauled Myanmar's constitution in a way that critics say was aimed at tightening the regime's grip. The constitution now requires more than 100 military nominees in parliament. Myanmar, also known as Burma, has been under military rule since 1962. Among those who boycotted the elections was opposition leader Aung San Suu Kyi's National League for Democracy party, which described it as a sham.